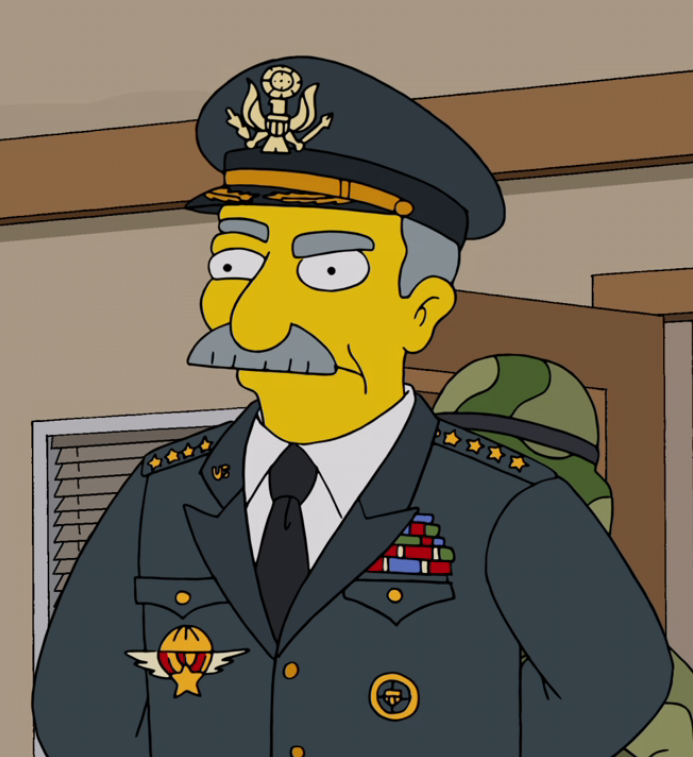 Clancy Wiggins is an army brigadier general in Springfield. He ordered the SkyMaster X5000 Jet Pack which was mistakenly delivered to Clancy Wiggum. Wiggum tried to escape from Wiggins and his soldiers, which resulted in the jet pack crashing into and demolishing the First Church of Springfield. He is seen during an opening game at the pee-wee Football season. Clancy Wiggins has dialogue in the Itchy & Scratchy Land event. Our friends in the military paid handsomely to test out their newest weapon. The ThrillBuster Anti-Theme Park Tactical Nuclear Warhead is a success! At last, our nation is safe from the threat of fun and rides. These guys prepare for everything. Modified on July 11, 2018, at 18:51.